2014 NM True Treasure- NM.Org-NM Television episode #3. Hours: Open daily 9-5 Monday-Sunday. Open Every day at 7320 Hwy 54/70 (575)437-0602. Tours from 10a.m. to 4 p.m. daily. Wine sales & tasting begin at 12noon on Sundays by State law. Government issued picture ID is required. Vertical and expired licenses are not accepted. Military ID and Passport and Driver's License are valid forms of ID. Must be 21 to taste or purchase wine. NM law requires proof of age and does not allow sale or service to intoxicated persons. Legal intoxication is .08 and we limit our free samples to 4 tastes. We sell wine by the bottle or case. We can ship to certain states depending on individual state laws. Visit PistachioLand. Farm tours Daily: at 10a.m., 11a.m., 12 noon, 1p.m.,2p.m., 3p.m. and 4p.m. The McGinn's offer military discounts every day. Mention active duty or retired when you shop in store or via phone order. Thank you for your service! 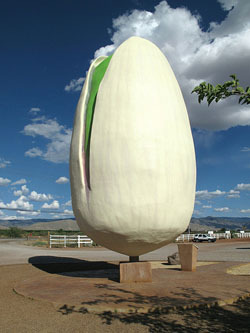 The World's Largest Pistachio. Enjoy video, links, and pictures of one of southern New Mexico's largest outdoor sculptures located at our Pistachio farm! PistachioLand is home of The World's Largest Pistachio, McGinn's Pistachio Tree Ranch, McGinn's Country Store, and Arena Blanca Winery. The McGinn family grows the best selection of award winning pistachio nuts on our family's 111 acre farm. We also make fabulous wines from our vineyards. We KNOW they're the best because we grow them, package them, make candy with them.....everything from the gound to the final packaged product and we guarantee you will find these Pistachios and Wines to be the best anywhere! How are we Unique from other Pistachios? Our unique high desert conditions produce exquisite tasting pistachios. We have also created our own unique blend of spices and flavors and roast them in many varieties like Garlic, Habanero Limon, Black Pepper, Lemon-Lime, Ranch, Spicy Ranch, Barbeque, Red Chili, Green Chili and classic salted. We make our own pistachio candies daily at PistachioLand. Our Pistachio Brittle and Atomic Hot Chili Pistachio Brittle are both unique and delicious. We offer original flavor combination bags like The Works and The Chili Bag, for those who want to sample more than one flavor at a time. 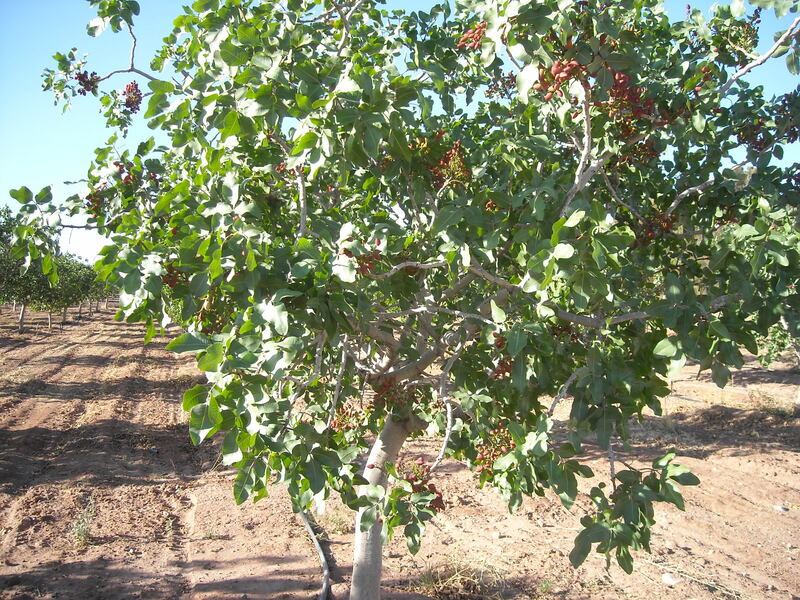 We also sell grafted pistachio trees every February! We are a small family farm with 4 farm employees who perform daily field maintenance, water and fertilize, harvest, process, roast and package our delicious pistachios. Our store employees help us to market, cook our delicious candy, package our products and mail our fabulous pistachios and wines throughout the world. Our vineyard and winery produce delicious grapes and wine produced by Tim McGinn, our winemaker. We also offer motorized tours daily through our orchards and vineyards and will tell you about our family farm history, pistachio and grape growing and harvesting, and the story behind the World's Largest Pistachio.